Already the marine layer has slipped over Point Loma, sending tendrils of vapor scouts into the bay. The bulk of it waits like an invading force just off shore, pushing forward in infinitesimal increments so that you don’t notice the world to the West disappearing inch by inch. A sailboat vanishes in the matte wall. The palm trees on North Island blur and fade into grey. Only the retreating sun’s warmth hold this eater of what-can-be-seen back. And once the sun has lost its grip on the day, we will find ourselves suddenly surrounded–shrouded in a world of shadows and ghosts. 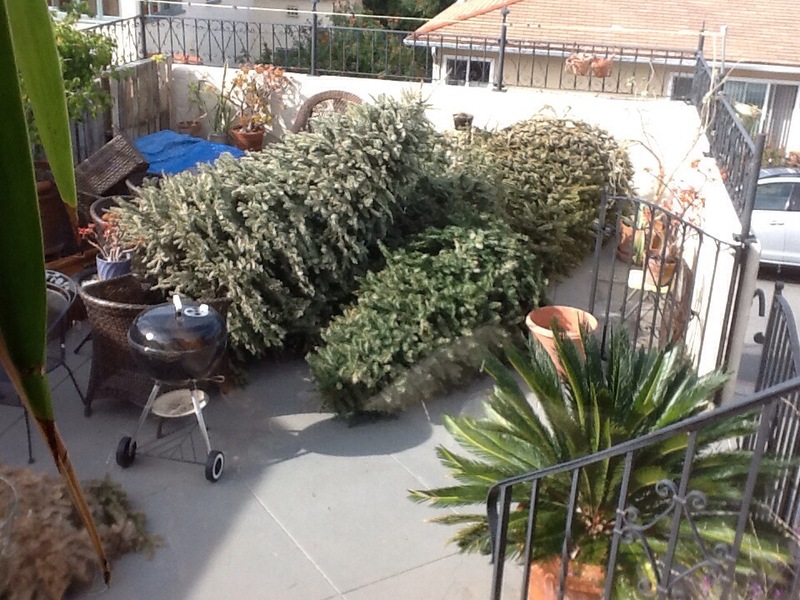 As I wait for this moment (and those bringing trees to arrive), I think of small points of comfort in our sometimes dark world. Places where humans connect and share in each other’s humanness and perhaps that spark of the divine. Just now, a woman is collecting shells along the beach. She is weathered-looking and barefoot. A ratty red hoodie hangs on her lean form; the edges of an orange sarong flop around her knees. She takes measured steps along the water’s edge, placing tattered shells in a dirty pint glass. Eyes fixed on the sand, she approaches me. “Here.” She offers me a horn shell that only has the slightest chip on its edges. Probably one of few whole shells she’s collected on this bayside beach. Her smile is shy. What a gift. She chose me to share the beauty of this moment in her life. And with no further conversation, she walks away. Now the mist rushes in. The top of this wall of tangible air backlit by the sun. It forms orange and white swells and crests like an aerial sea. A tsunami of cold, wet air floods the beach. But before we are submerged, the last rays of the sun tap on the windows of the downtown buildings. Each flare up at this touch, sparks of candles sputtering in the last minutes of this day. The buildings are plated in mother of pearl, fiery and opalescent. All around us, even as the grey gathers strength, the air is suffused in a soft pink light. People pull on hoodies and jackets as near-naked babies play in the purple waves. The trees arrive and dark forms drag their shaggy masses across the sand, leaving sweeping trails that are soon wiped clean by playing children. We line the trees up near the fire pit like a hedgerow to protect us from the growing dark. Against my advice, the guys build a pile of kindling in the fire pit. Their thoughts are that they’ll need some preliminary fire to get the trees started. 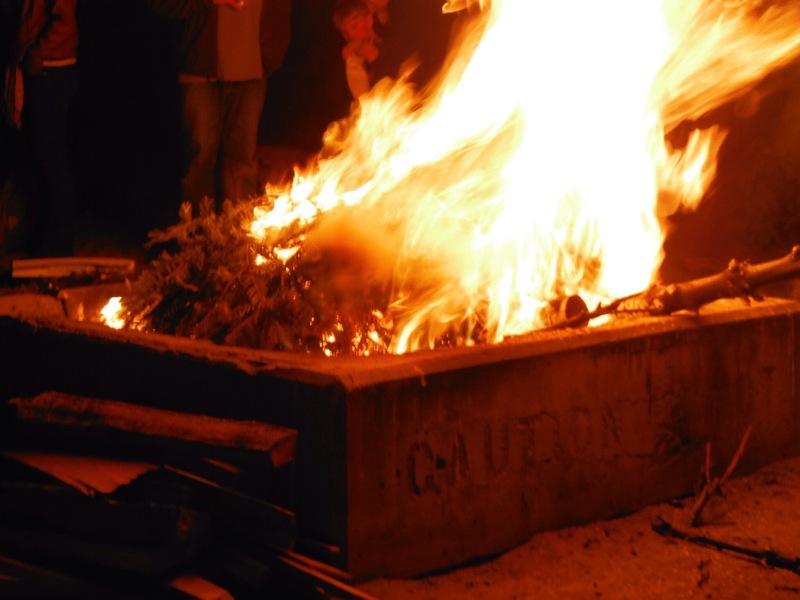 They think that these dry, fragrant testaments to the holidays won’t want to burn. That unless coaxed, they’ll resist the flames. I know better. After a season of standing tall in living rooms, bedrooms, by windows, against walls, dying cells constricting the flow of water in their stands, these trees are ready to burn. They’ve been dying for weeks. They embrace the flame. But that’s something you won’t believe until you’ve seen it for yourself. With a whoosh! and fierce crackling, the first tree explodes. The beach is suddenly bright as a clear afternoon, and our illuminated faces are all wide-eyed as a few of us frantically pull a few of the closer trees away from the flying embers. A tower of flame stabs at the sky and then, just as suddenly as it appeared, it crashes down into the pit. Grey night once more with only a spear of charred trunk offering any warmth. The night continues like this: moments of fierce heat and light punctuate the inevitable thickening of the damp, cold darkness. We are so caught up in the flare of trees (everyone is much more careful–no one calls for kindling now) that we don’t notice when downtown disappears. Then the moon. Then the sailboats moored just offshore. For now we are singing and laughing. We are taking off our hoodies and coats, warmed by the fluctuating fire. Children toss a ball through the air, dropping it in the dark, diving into the sand. They are sticky with sweat and s’mores. Filthy faces full of joy appear and disappear in the lighting and expiration of each tree. We have a lot of trees. Each one is cause for a pause in the conversation, a moment of shared awe in the sheer power of heat and light and sound that comes from the burning. A moment of shared souls in the dark.